The maternity nursing dress selection on the market is vast, with something to appeal to every woman. Some women prefer a dress that’s going to be suitable for them from pregnancy through to birth, while others want one that will be comfortable for childbirth or ideal only for breastfeeding. Fortunately, a range of such options exist, and you don’t have to wear your regular clothing which may not be adequate. Whether you’re heavily pregnant, giving birth, or want to be able to breastfeed discretely in a dress, you will find you are spoilt for choice. However, given the price tag of many of them, it’s crucial to put some thought into your needs before going ahead and making a purchase. Decide the style, budget, access point for baby and the comfort and fabric too. All of these considerations matter when choosing the best maternity nursing dress for your needs. Any of these nine below may be a winner. When you’re breastfeeding your baby, a maternity nursing dress is a must-have garment. Wearing a standard dress is no longer a convenient option as you have no way to provide access to your baby without pulling your clothing up. Rather than be uncomfortable or feel like you need to leave the room, you can purchase this Bearsland women’s maternity nursing dress and look stylish with functional freedom at the same time. As you sit or stand, you can lift up the double layer and allow your baby to feed privately. The second layer of the dress covers their head and your breast as well. However, this dress is more than a functional maternity nursing dress. It’s also a stylish and lovely garment you can wear to any event in the day or night. You can choose from 14 color and pattern options, there sizes, and know that for any occasion, it’s going to be suitable. It also features both spandex and polyester which means it has plenty of stretch and space if you feel self-conscious about your postpartum curves. It is an ankle-length dress with a sleeveless design and will also not cost you the earth to own. If you want to be comfortable and classy when breastfeeding your baby, set your sights on this maternity nursing dress from Bearsland. There is a common misconception that when you buy a maternity nursing dress, it has to be dowdy, frumpy, and generally not stylish at all. Thanks to Ekouaer that is no longer the case. You can be pregnant or breastfeeding and still look glamorous – as if you just walked down the catwalk. Thanks to the sleek design, gorgeous color options, and a comfortable fit, this maternity nursing dress will tick the boxes for a range of women. You can choose an elegant color suitable for any wine and dine event, as well as three comfortable sizes. These sizes are also reasonably roomy due to the cloth and spandex fabric. For ease of feeding your baby, the high waist style, layered chest, and discrete split will also appeal. Rather than try to hide away or shy away from wearing a dress, you can form a gap in the shoulder sleeve and let your baby have their dinner. The soft and stretchy fabric also makes this maternity nursing dress suitable for when you’re pregnant and when you have the baby as well. Such versatility with a nursing dress is not guaranteed, so there’s every reason to consider adding it to your shopping cart today. 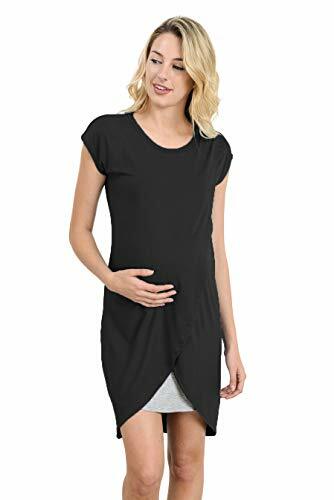 Trying to find comfortable clothing to wear while you’re pregnant or breastfeeding is a challenge, but if you buy this maternity nursing dress, you will learn that it’s not impossible. Rather than deal with stripping off layers to feed your baby, or feeling uncomfortable while you’re pregnant, you can wear this spandex and cotton multi-use dress and reap the rewards. It’s soft and comfortable against your skin, doesn’t irritate or scratch, and you can wear it for any occasion as well. There are options aplenty with styles, colors, and sizes, meaning there is bound to be a Hotouch maternity nursing dress to suit your needs. What new moms and moms-to-be also appreciate about this dress is how easy it is to breastfeed in. Because it has two layers, you can lift one layer up and remain discretely covered. Whether you’re dressing to impress or for casual wear at home, this maternity dress is more than suitable for the occasion. 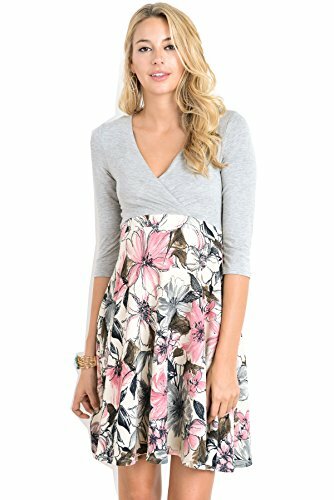 If you want your clothes to look stunning and stylish, and less like a maternity nursing dress, then set your sights on this three-quarter sleeve nursing dress from Meenew. Even though these dresses serve a purpose as either a maternity dress or breastfeeding dress, they look like a stunning outfit. No one needs to know that’s its intended purpose. Choose from four sizes and four colors to give you the ultimate buying power, then benefit from a range of convenient features. You will love the effortless pull-on style, as well as the durability, comfort, and stretch of the rayon and spandex fabric combination. The double-layer design of this maternity nursing dress is also a stand-out feature. You can breastfeed discretely without baring too much skin, all the while being able to keep your clothes on and in place. Very few garments can act as a stunning outfit and a form of maternity or breastfeeding attire, so it’s well worth considering. Hot and summery weather can be exceptionally uncomfortable when you’re breastfeeding or pregnant, especially if you’re wearing a heavy and cumbersome maternity nursing dress. While most dresses on the market are designed to be suitable for breastfeeding mothers and pregnant women, they are less practical in hot weather. After all, you want to be able to breathe. Thankfully, this sleeveless maternity nursing dress plugs the gap in the market by being a lightweight, flowing, and soft summery dress that’s suitable for any warm-weather occasion. You can choose from four sizes, 18 color options, and benefit from the knowledge that it’s a comfortable dress for any time. You can wear it for lunch or dinner, or even while you’re lounging around home. Any new mother or mother-to-be is going to look the part in this comfortable maternity nursing dress. What’s more, it’s a dress built for function. Thanks to its two side pockets you can carry a range of accessories, while also having two layers for discrete and effortless breastfeeding. You can lift up the fabric, let your baby have their dinner, and still make sure you’re comfortable and hidden. Sealing the deal is the affordable price tag, offering you peace of mind that you don’t have to spend the earth to be comfortable while you’re breastfeeding or pregnant. If you’re looking for a maternity nursing dress that will be suitable for trips into town as well as lounging around home, then set your sights on this one from Ekouaer. Even though it’s entirely comfortable, supportive, and stretchy, it’s also an exquisite design which makes it suitable for wear on any occasion. Wear it out shopping, to the grocery store, or even while you lie on the couch at home. What’s more, this dress which is available in five sizes and three colors, is entirely versatile. You can wear it while you’re pregnant and it has plenty of support and side pleats, or while you’re breastfeeding as well. Thanks to its o-neck style, front button placket, and double layers, it’s more than suitable for feeding your baby on the go. The material is also another standout feature. 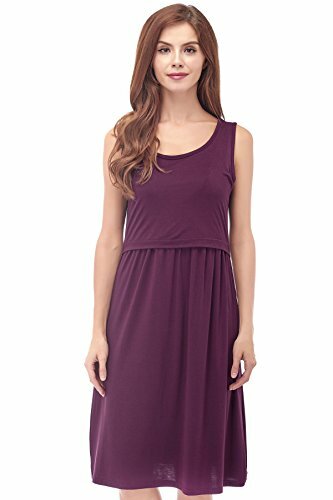 When you’re pregnant or breastfeeding, you want to be comfortable, and this maternity nursing dress ensures you are. It features a fantastic blend of cotton, polyester, and spandex for the right amount of stretch. However, it also fits snugly for additional support around your bust and stomach. This maternity nursing dress ticks all the boxes for a range of mothers and mothers-to-be, so it’s well worth adding to your shopping cart today. Rather than spend a fortune on a maternity nursing dress that doesn’t fit right or isn’t comfortable, take a closer look at this one from Bearsland. 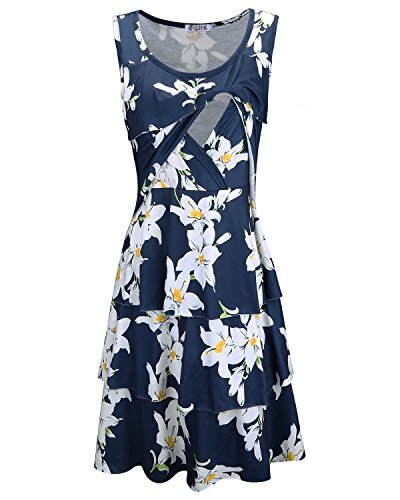 In the heart of the summer months, you can wear this maternity nursing dress and benefit from how comfortable, lightweight, and stretchy it is. It comes in nine patterns and colors to be suitable for a range of occasions, all the while suiting a variety of pregnant and breastfeeding women thanks to the four generous sizes. Rather than opt for tight-fitting dresses, set your sights on this one. For wearing while you’re pregnant and breastfeeding, this dress is going to tick all the boxes. It features two discrete layers which means you can pull one up and feed your baby without having to hide. The fabric is also soft and stretchy, supple against your skin, and comfortable to wear for hours on end. 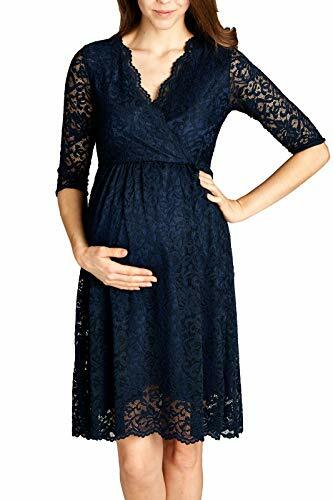 When the time comes to invest in clothing for your pregnancy or breastfeeding, there’s every reason to consider adding this maternity nursing dress to your shopping cart. Even though you do need to pay a little more for this maternity nursing dress, you will end up being pleased that you did. While it’s not cotton and the material is thin, it’s a lightweight, soft, and comfortable dress that you can wear as a pregnancy outfit or when you’re breastfeeding. The most standout feature of this maternity nursing dress is the way in which you can discretely breastfeed your children. Rather than lift up a double layer like most other dresses on the market, you can separate the strap so a gap forms in between. You can then let your child feed discretely in any situation. What’s more, this dress is layered, stretchy, is a generous length of 90 to 95 centimeters, and is available in six sizes. As a result, you are bound to find one that fits you. Once you choose a size, you can then take your time to decide which of the 29 colors and patterns is going to suit you the best. This dress is incredible. It’s suitable for wearing at home, while you’re out and about, or even if you’re going out for a special event. No one also has to know that it’s a maternity nursing dress. 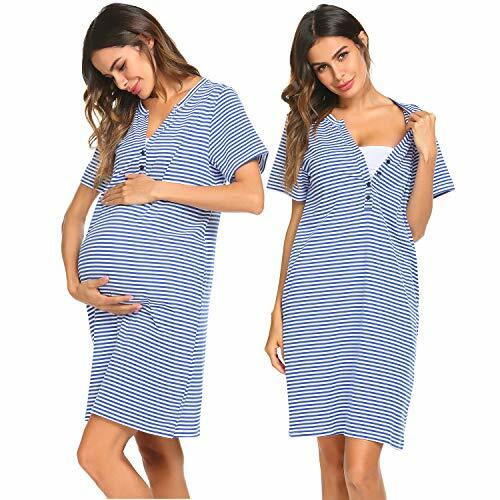 Going into labor is not a comfortable experience, but it can be more so if you purchase this maternity nursing dress from Kindred Braveley. Instead of feeling uncomfortable and daunted by the prospect of wearing a scratchy and unstylish hospital gown, you can bring a beautiful one. There are four patterns from which to choose, including hearts, quatrefoil, flowers, and dots, and the sizes are generous as well. Because you will have a significant baby bump, the larger the gown, the more comfortable you are. Unlike hospital gowns, this maternity nursing dress has velcro closure systems as opposed to ties. It’s now quicker to benefit from skin-to-skin contact with your baby, as well as feeding them faster and with more coverage. 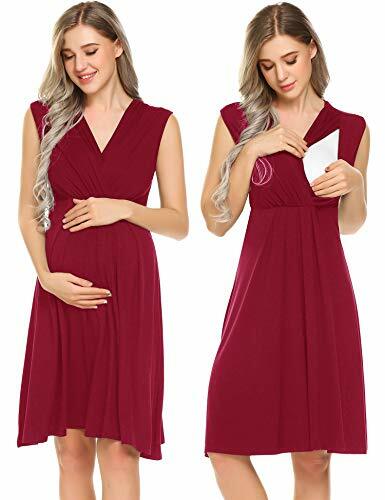 Overall, this maternity nursing dress offers far more coverage than a hospital gown, leaves your dignity more intact, and is exceptionally comfortable to wear. Whether you’re having your first baby or your fourth, it’s worth the money to purchase this delivery gown and reap the rewards. When it comes to purchasing a maternity nursing dress, there is no denying that any maternity dress is going to be more convenient than a regular garment. After all, they are purpose-built for the occasion. However, it’s worth knowing that not every dress is the same. As a result, what you enjoyed about one type of maternity dress may not be present in another. If you are stocking up on maternity clothes or you’re looking for garments postpartum, it’s crucial to do your due diligence. Below, you will find a few of the many things to consider before adding new maternity nursing dresses to your shopping cart. Paying attention to these points may save you hundreds of dollars. The size of your maternity nursing dress is probably the most critical consideration. Before you were pregnant or breastfeeding, choosing clothing to fit you wasn’t a problem. Now, however, you must factor in your stomach size and even your bust dimensions. What fit you before now may not. Don’t leave poor feedback for an online manufacturer because you didn’t do your due diligence. Measure your bust and belly and compare it to the sizing guide provided by the manufacturer. You can then rest assured the maternity nursing dress is going to fit you when it arrives. The fabric is crucial because it needs to be comfortable against your skin. If you are not wearing anything under the dress to make it more comfortable for breastfeeding, then soft fabric such as cotton is going to be a preference. However, not all maternity nursing dresses are cotton. Some features viscose which can be harsher on the skin. Also, pay attention to the spandex percentage. You will need a bit of stretch for comfort. When you’re breastfeeding, you can’t wear a regular dress. If you do, you have to find a quiet place to feed your baby, lifting it up and exposing your entire body! If you buy a maternity nursing dress, however, you don’t need to do that. Most maternity dresses feature an access point for baby to feed, but they vary from one dress to the other. Think about the access point you prefer. Would you rather have a double-layer dress with one layer you can lift up? Or, would you rather a split in the sleeve of a dress that enables baby to fit between it? Think about what makes you more comfortable before going ahead with the purchase. Fortunately, most maternity nursing dresses on the market are suitable for any occasion. However, not all of them are. When you’re looking for a dress for your heavily pregnant body, or for breastfeeding, then think about what you need it for and what your requirements are. If you buy an evening gown, it’s going to look out of place during the day. If you buy a casual t-shirt dress, however, it’s less suitable for going out for dinner in. Find a healthy balance or select a maternity nursing dress for every occasion.